The Department of Social Welfare and Development (DSWD) has allocated a total of P8, 255,820,000 for the social pension fund of senior citizens. The target beneficiaries of the agency have to reach up to 1,375,970 senior citizens in the whole country. The allocation is for Social Pension Program for Indigent Senior Citizens (SocPen) that will cover the elderly who are frail, sickly, do not receive any pension and have no other source of income and support coming from their families. According to DSWD Secretary Judy Taguiwalo, P4,243,330,500 of the allotment have been utilized for this year. 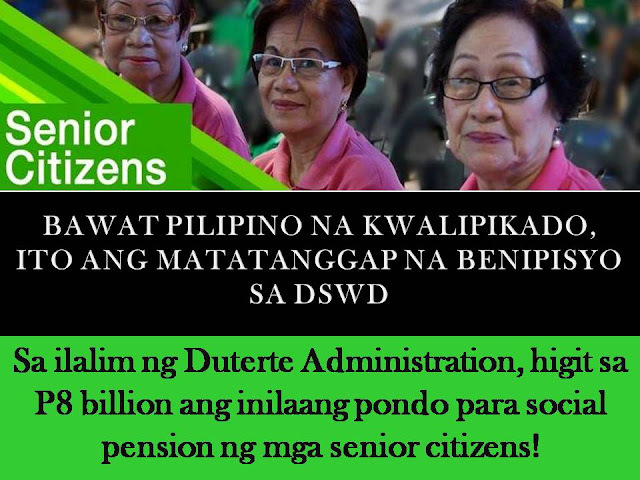 Under the SocPen, the senior citizen beneficiaries will receive quarterly stipend worth P500 each month, as government assistance for their daily living and medical needs. Funeral and burial expenses include casket or urn, embalming, cremation cost, and other services. Grant of a minimum of 5% discount relative to the monthly use of water and electricity, provided that the meter is registered under the name of the senior citizen residing therein and does not exceed 100 kWh and 30 m³. Training fees for socio-economic programs conducted by private and government agencies subject to the guidelines issued by DTI, DOLE, DA, TESDA and DOST-TRC. 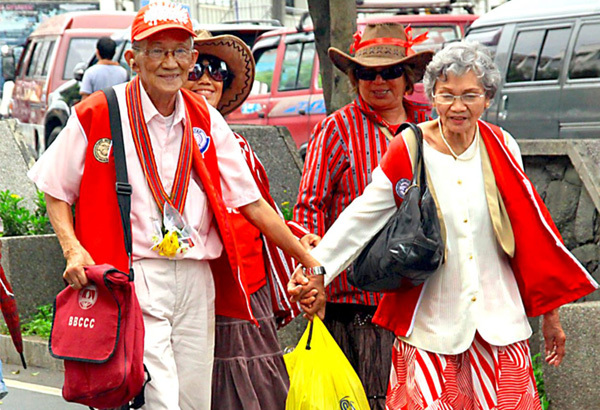 All senior citizens are covered by the national health insurance program of PhilHealth. The social safety assistance shall include, but not be limited to, food, medicines, and financial assistance for house repair to cushion effects of economic, disaster and calamity shocks. The assistance of a minimum of P2,000 shall be given to the nearest surviving relative who took care of the deceased senior citizen. Assistance shall be granted to senior citizens to pursue education through the provision of scholarships, grants, financial aids, subsidies and other incentives. -Continuance of the same benefits and privileges by GSIS, SSS, and PAG-IBIG as enjoyed by those in active service. RA 10645, an amendment to RA 9994 to provide mandatory PhilHealth coverage for all senior citizens. HOW TO GET SENIOR CITIZENS ID? In order to get and enjoy the above mentioned benefits and privileges of a senior citizen, first you must secure a Senior Citizen's ID. 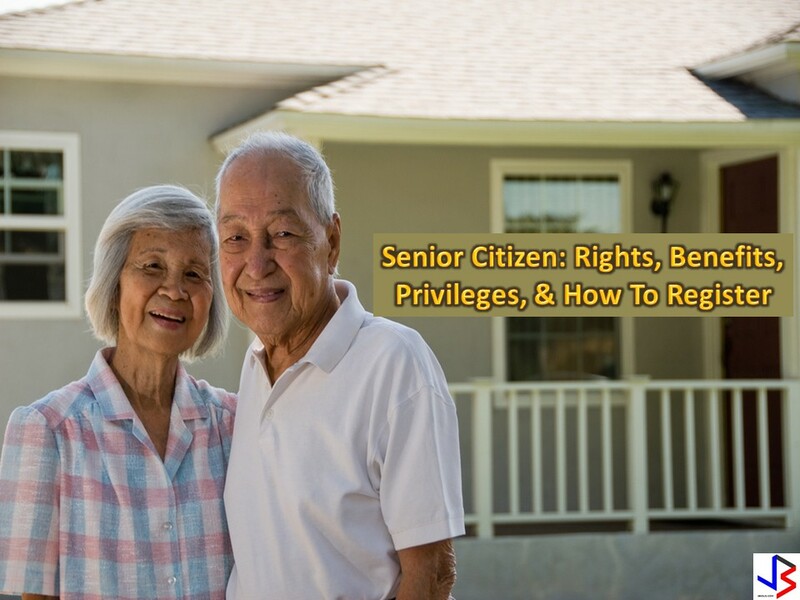 If you completed the said requirements, just go to the Office of the Senior Citizens Affair (OSCA) in your city or municipality and apply for an ID. Much better if you are being accompanied with one of your daughter or grandchildren. The staff will just fill the card with your personal info like complete name, birth date, and address. If your ID is finished, you have to sign it, but first, you must double check if all the details are correct. 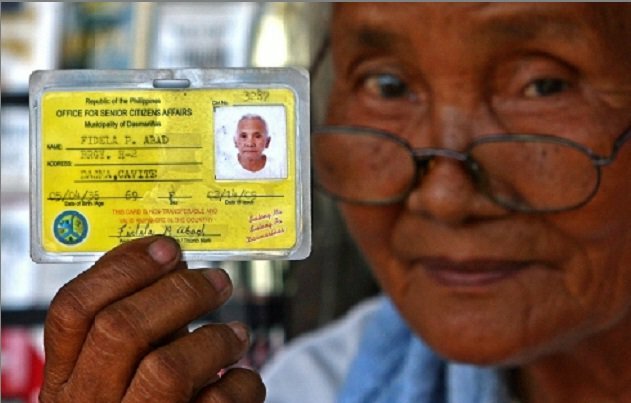 Indigent senior citizens or their authorized representative must present their Office of Senior Citizen Affairs ID and birth certificate or any other document proving their date of birth to the nearest OSCA, City/Municipal Social Welfare and Development Office or DSWD Regional Office. The authorized representative must also present his/her identification card and an authorization letter. All potential beneficiaries will be assessed to ensure that they qualify for the program.